NASHVILLE, Tenn. (August 10, 2015) – Ridgerock Entertainment Group and P23 Entertainment Inc. announce the January 8, 2016 theatrical release of THE MASKED SAINT through Freestyle Releasing. 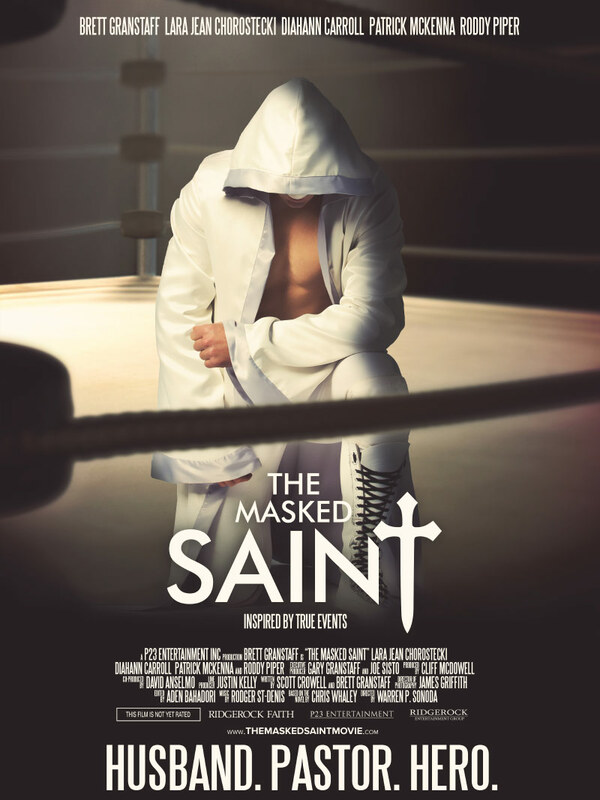 A family-friendly action film inspired by true events, THE MASKED SAINT is the first of many faith-based films that will be produced by Ridgerock Entertainment Group’s newly formed “Ridgerock Faith” division. Winner for Best Picture at the 2015 International Christian Film Festival, THE MASKED SAINT is written by Scott Crowell and Brett Granstaff, directed by Warren P. Sonoda, produced by Cliff McDowell, co-produced by David Anselmo and executive produced by Gary Granstaff and Joe Sisto. The movie also stars Lara Jean Chorostecki (Hannibal), Oscar and Emmy nominee Diahann Carroll (“Grey’s Anatomy,” White Collar) who won a Golden Globe for her performance in “Julia,” Patrick McKenna (“The Red Green Show”), James Preston Rogers (Pixels) and the late WWE Hall of Famer Roddy Piper in his last confirmed theatrical release. P23 Entertainment Inc. is a family and faith-based film production company, located in Toronto Canada, which aims to communicate family values through productions of the highest cinematic quality. Founded by award winning producer, Cliff McDowell, P23 produces and distributes both animation and live action feature films that are family friendly and entertaining. For more information, please visit www.p23ent.com. Founded in 2004, Freestyle is one of the top service theatrical distributors with unique capabilities in distribution, sales service, marketing, and varied national and international output deals. Freestyle handles both wide and limited release patterns that range from 2500 screens to exclusive engagements. They have offices in Los Angeles, New York, Dallas, and Jacksonville. For more information, please visit www.freestylereleasing.com.